Tremors, sometimes mistaken for a psychological problem, find their roots in a neurological condition. About 10 million people suffer from tremors, according to the Tremor Foundation. While your head and voice may also be affected by tremors, your hands are most likely to fall prey to these involuntary synchronizations of the muscles. Essential tremor, the most common type, stems from a neurological disorder unrelated to any disease. Illnesses that may cause tremors include Parkinson's disease, metabolic disorders, toxicity from heavy metals or alcohol withdrawal. Wrist weights may alleviate tremors but could also worsen them, so check with your physician before pursuing this form of treatment. Because medications prescribed to treat tremors may cause unwanted side effects, your doctor may recommend alternative treatments like weight belts. Wrist weights "may dampen the aptitude of the tremors and make the limb more functional," according to Dr. Allan H. Goroll and Albert G. Mulley, authors of "Primary Care Medicine." The CIDPUSA, a foundation that provides research and patient support about neurological disorders, also says that wrist weights prove effective in treating tremors with frequencies of 3 to 10 Hz, wrist weights are an effective treatment method in the case of tremors. CIDP stands for Chronic Inflammatory Demyelinating Poly radiculo neuropathy, but the official name of the organization is CIDPUSA -- just the initials. You should not rely on wrist weights alone to relieve tremors, according to information provided by the Johns Hopkins Medicine website. Although weighing down your limbs may prove helpful, few patients can function normally using this form of treatment alone. A better approach, according to Johns Hopkins, includes combining wrist weight therapy with medication. Surgery may also prove advisable for some patients with tremors. Although wrist weight therapy may reduce your need for medication, do not stop taking medicine prescribed for your condition without consulting your physician. Wrist weights may provide relief from tremors but will not make them go away. Wrist weights may also do little to negate the frequency of tremors, according to Richard Tidball Johnson and Justin C. McArthur, authors of "Current Therapy in Neurologic Disease." The authors say that wrist weight therapy helps bring down the amplititude of tremors but will not lessen their recurrence. The frequency of tremors is controlled by your brain. Wrist weight therapy can potentially worsen your tremors, particularly with prolonged use. 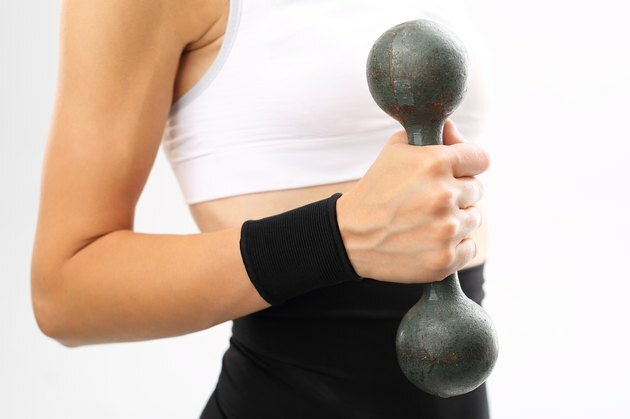 Some patients who used wrist weights for long periods found that, after removing the weights, their tremors occurred more frequently, according to the Multiple Sclerosis Resource Center. Although wrist weight therapy may benefit you, seek the advice of your physician before applying the therapy to your condition. And follow your doctor's recommendation about how long to wear wrist weights to avoid potential drawbacks with this type of treatment for tremors. Collective Wizdom: Why are My Hands Shaking?